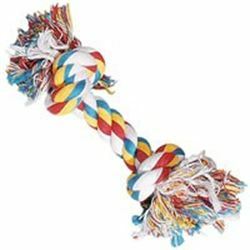 As a professional pet sitting and dog walking company we see it every day – rope toys. Rope toys have become very popular of late. Go to any pet store, and you’ll see a variety of shapes, sizes, and styles to choose from. They are even touted by many vets as great “natural flossing” tools for your dogs. While that may be the case, we’re hoping that people will reconsider using this toy. We’re also advocating that all professional pet sitting companies warn their clients about the danger of giving this toy to unsupervised dogs. Rope toys can kill dogs and we don’t want to see one more death due to people being unaware. Case in point is Lea Robinson’s story. Unfortunately, Robinson’s dog is not the only dog who has died after playing with rope toys. The Internet is strewn with similar tragedies related to this seemingly innocuous toys. Needless to say, a professional pet sitting company is tasked with a reasonable duty of care. We would hope that all professional pet sitters go above and beyond where care is concerned. Please don’t be worried about what a client or potential client may think. There’s no such thing as being over-cautious when the life of an animal is at stake. They depend on us to take care of them. As with all toys, we give our dogs, we have to continue doing everything in our power to make sure they are safe and harmless. Please help us spread the news that rope toys can be very dangerous by sharing this article with your friends.